However, latest ground intelligence indicates that Pasilan 2000 has been developed with characteristics similar to a rocket launcher. The way the tube is installed in the above picture is similar to the positioning of rocket pods. The length and caliber of the barrel indicates Pasilan 2000 system has common features to the Chinese made Type 82 130mm 30-tube MLRS (introduced by the Palestinian Liberation Army (PLA) in the early 1980s) rather than rail-guided Katyusha variants such as the Qassam Rocket. The rocket weight for Type 82 is around 25-30kg, and the Pasilan 2000 warhead has been known to have the same weight. Recent intelligence reports have cautioned that the latest variant of Pasilan 2000 may have a range of upto 25kms. 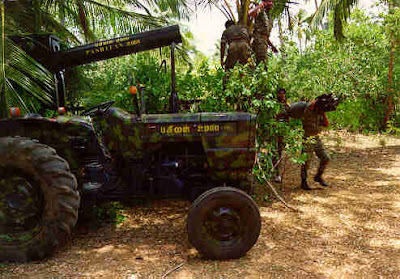 Our speculation about the LTTE’s production of Pasilan 2000 is that the LTTE imported Type 63 130mm MLRS (early version of 130mm Type 82) which is no longer used by PLA, and installed as single tubes on their tractors allowing for greater camouflage and conceal of the weapon and less chances of damage in a single air strike. The rocket has since then undergone some modifications. Pasilan 2000 is not heavily used for ground attacks currently, but if imported artillery and rockets run out, the weapon could become a significant counterbalance to SLA's MBRL and a hindrance to troops. 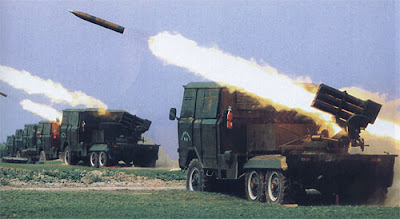 The Type 82 130mm 30-tube multiple launch rocket system was introduced by the PLA in the early 1980s as a successor to the ageing Type 63 130mm artillery rocket system deployed at division artillery level. The system is carried by a 6X6 truck with 30 launch tubes grouped in three rows each with 10 tubes. The rocket system made some modest improvement over the Type 63, but is inferior to the Type 81 122mm artillery rocket system. Only a limited number of examples were built before it was replaced by the Type 81. Some Type 82 rocket systems are still in service with the PLA reserved forces (source).